I have a lot of good news to post today. My dose of Rituxan went great yesterday! I did not have a reaction at all so we were able to speed up the rate a little to get it done faster, which will ultimately get me out of here sooner ;). 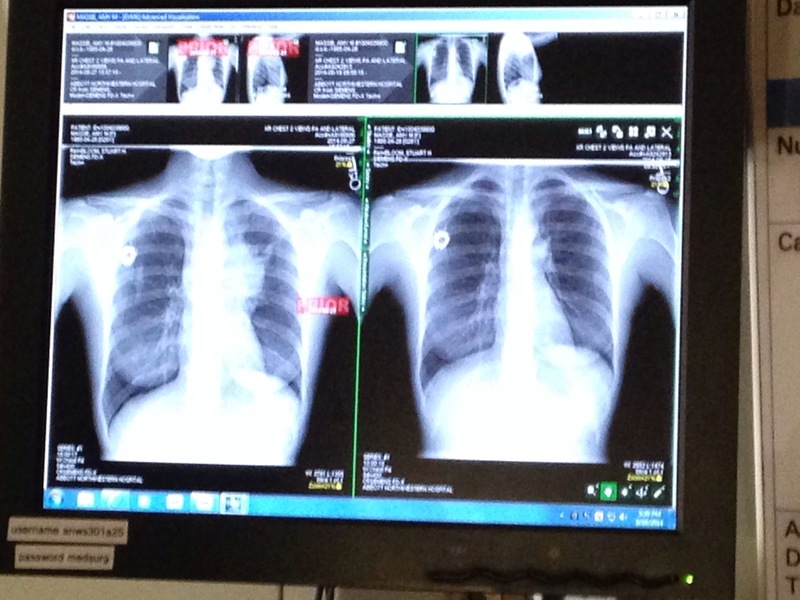 I also had an xray done yesterday And my tumor has shrunk incredibly. It is to the point where it is not visible on the xray. I will post the picture at the end. This means I am responding to the chemo as expected which is great news. That was always a worry. Even though I have been very positive and optimistic, I already have a rare form of cancer that usually stays localized. Mine spread to a stage 4 so I hoped and prayed I wouldn’t be a rare case where I don’t respond to treatment so I am so happy to be in the clear on that and have these amazing results already after one cycle. I do still have to finish all of the cycles of course. Even though the large mass is practically gone. There is still cancer there that we have to keep fighting. More and more will die each time and we don’t want to leave even a single active cancer cell behind. Later on I will have a PET scan which will detect any active cancer cells since an xray cannot do that. I am very thankful and grateful to have such good results early on. Thank you to EVERYONE who has been praying for me. I appreciate all of it. And keep praying!!! I’m not in the clear yet. It is still just the beginning. This is another one of the reasons I wanted to start a blog so I can get my story out there and have as many prayers possible. I do believe prayer!! Not just for healing physically because ultimately it is In Gods hands and what God has planned for me. But like I have said from the beginning. I do not believe it is His plan for cancer to take my life. I have felt that from the beginning for some reason. When I first found out I had a “suspicious” mass the size of a grapefruit in my chest. There were so many different things it could be. People would tell me it’s most likely nothing. But I knew that it was cancer and I knew I was going to be okay. And that is exactly what happened. I just knew. I went in the next day to find out I do have cancer and that it is treatable with a good prognosis. I have always felt that was Gods plan for me at this time. Of course I am not “cured” yet. There is a still more to do to get rid of the cancer and always a possibility for it to come right back but I will continue to pray. I do believe there are different ways in looking at healing. Though I am not physically healed yet. I do feel like God has healed me already. He has healed me of fear. He has healed me of negative thinking. I no longer spend countless hours on the internet researching what could go wrong and so on. He has healed me of any bitterness and anger that would not be uncommon in a situation like this. He has “healed” me of so much already which has made this process a lot easier. Yes I do believe in miracles and I do believe God can cure. But I do know that that a cure does not always happen no matter how much praying we do. Sometimes we are not cured here on Earth but we are always “cured” physically in heaven. So whether cancer takes a life or not. God still stands by his promise and we will all be cured of disease at some point whether on Earth or in heaven. I believe the key to finding peace is to know that God can heal you and healing is different for everyone. When I first was diagnosed, I felt a little frustrated every time someone would tell me God will fix all of this. I felt like well what if he doesn’t. People die of cancer. What about them. What if that’s me. God might not let me live. And what if he doesn’t. Does that mean prayers weren’t answered. No I don’t believe that. That is why it’s important to know that healing comes in many different ways. Everyone is going to have a different plan. Even if cancer takes your life. You are healed in heaven and family and friends should be looking to discover how Gods plan is going to heal something in their life. You just have to look for it and you have to believe. So here I am day two. My chemo started last night. So far so good! Here is the pic of my xray. You will see in the first picture a large mass on the upper right side that sticks out a little on the left as well. The majority of it is behind my sternum so you can’t actually see all of it except the part that sticks way out on the right and a little on the left. The second picture that large mass is gone. Tadah!!!!!! Truly Wonderful! I love your words too…”Earth or in heaven. I believe the key to finding peace on earth is to know that God can heal you and healing is different for everyone.” Love that! Love your xray and I too am very VERY pleased with the results so far keep FIGHTING! So glad to hear the good news!! So thankful!!!!! Prayers continue….you’re in the hands of the Healer….